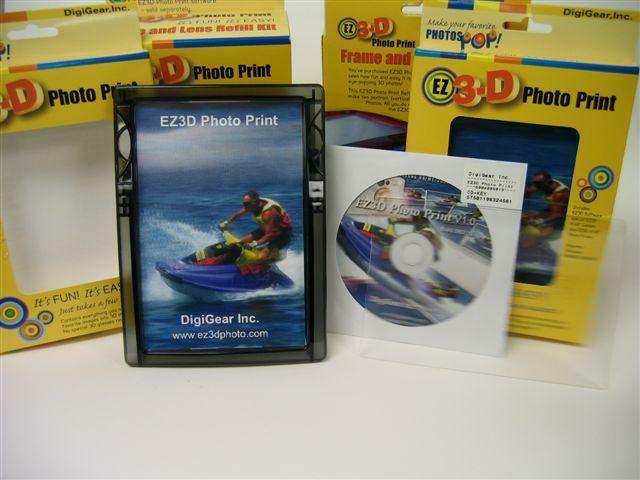 EZ3D Photo Print is basically designed for those who have photo printer and digital camera, and want to do something funny and special for the photos. Indeed, it can help you easily create 3D photos with your existing normal 2D photos. You don't even need to know anything about 3D technology. 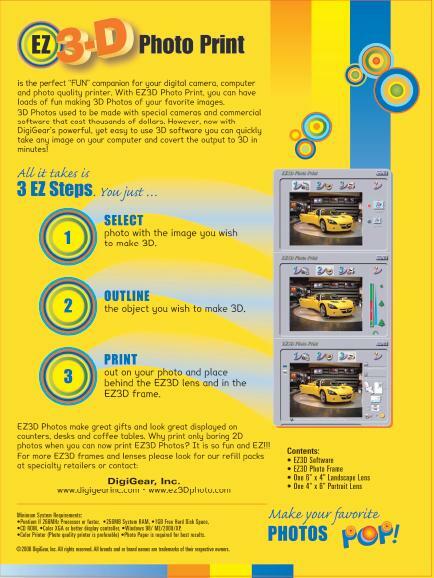 To create a 3D photo is very easy as "1-2-3". Yes, just follow the "1-2-3" steps as Foto3D Print requires, anyone can easily finish a 3D photo in a few minutes by himself. 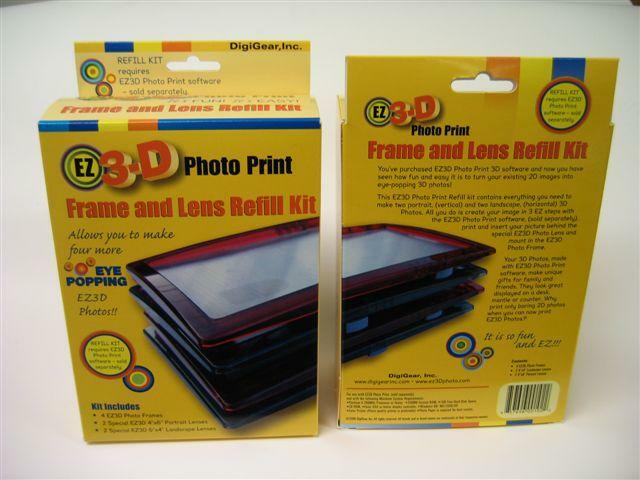 It is also a great product for business involving a digital camera and photo printing. 1. For Windows 98/ME/2000/XP/Vista/ 7. 2. GUI (Graphics User Interface) for friendly operation. 3. Extremely easy to use. 4. Converts existed 2D photos into 3D photos. 5. The "Depth" and "Distance" of 3D Object can be adjusted. 6. Supports text string as a 3D object. 7. Supports any color printers. 8. Accepts any DSC photo images and most image formats. 9. Supports 4"x6", 6"x4", 3"x4" and 4"x3" printout size. 10. Can preview 3D effects with DigiGear LC Shutter Glasses (optional) before printing. 11. Great fun for digital camera and color printer. 12. No lens lamination is required. No risk for 100% success. Outline a picture - Set up a 3D object. 3D Depth - There are "Large", "Medium" and "Small" options to set up. 3D Distance - Adjust the 3D object distance between near and far. Font Editing - Add a text string to enrich the 3D effects. 3D Preview - With LC Shutter Glasses (optional) to preview 3D effects. Save Project - Save all of 3D settings for later use. Print Out - Print out the 3D photo with any printer. WARRANTY & SUPPORT. Tech support from manufacturer and PSI.